Wait, I didn’t have a summer vacation. We moved our son to grad school in Ohio earlier this month. I saw a record store as we returned the U-Haul to Hamilton, Ohio, but we didn’t stop. That said, I did manage to make a couple of record-digging excursions. We were in the Twin Cities on Fourth of July weekend, and a couple of weeks later, I made a swing through northern Illinois. They turned out to be bittersweet trips. My favorite record store in the Twin Cities was disappointing. Lots of records to look through, but it’s one of those places that’s increasingly mixing new vinyl with the used vinyl in the bins. Worst of all, the place smelled. Not that musty old record smell. No, it smelled of the pets that have the run of the place. The good news is that I discovered a new favorite record store in the Twin Cities. My friend Todd, who runs one of our local indie record stores, tipped me to Mill City Sound in west suburban Hopkins. We’ve been going to the Twin Cities for almost 40 years, but had never been in this part of the area. Highly recommended, both for the record digging and for the small-town vibe of downtown Hopkins. My $30 record-digging haul at Mill City Sound included the Beatles’ “Yellow Submarine” (yeah, a reissue, but you don’t see it often) and Sonny Curtis’ “Beatle Hits Flamenco Guitar Style” (which I’d never seen). I was so stoked to find those among the new arrivals that I forgot to circle back to grab another one I’d seen. So we returned two days later to get “Manufacturers of Soul” by Jackie Wilson and Count Basie, which was one of the records left behind on another record-digging trip two years ago. My favorite record store in Rockford, Illinois, also was disappointing. Lots of records to look through, but one of those places that’s diversifying into new vinyl, used equipment and comic books. Worst of all, they seem to be mailing it in on the used vinyl. Bins jammed so full you couldn’t flip through them. No room in the bins? Just throw new arrivals on top, loose. Come on. Make an effort. The good news is that I discovered a new favorite record store in Rockford. A decade ago, Culture Shock started out as a punk shop. It’s since matured into a place billed rather accurately as “half rock ‘n roll boutique and half record store.” Recommended on both counts, even if I didn’t find anything that day. When I go record digging, whether on the road or here at home, I don’t have a wish list. But I do keep an eye out for early Bob Seger records, even though I have most of them. Bob Seger was playing across town while I wrote this tonight. Zero interest in going because I know he never plays any of the great stuff from before the Silver Bullet days. So here’s one from the Bob Seger record I’ve never seen. Neither has my friend Dave, from whom I’ve been buying records since the ’80s. “Noah,” from “Noah,” the Bob Seger System, 1969. It’s out of print. More on this and some of Bob Seger’s other greatest hits in this post from 2011. My memories of Glen Campbell, who died yesterday at 81, come almost entirely from television. I think back to the earliest ’70s, and I see our family sitting together around the TV. There was something for everyone on “The Glen Campbell Goodtime Hour.” Comedy skits for Dad, country music for Grandma, folk and rock groups for me. That, in the fall of 1970, was our life. I pinpoint 1970 because that’s where the facts confirm the memory. In the 1970-71 TV season, Glen Campbell’s show followed “The Ed Sullivan Show” on CBS on Sunday nights. That was appointment television. My grandfather died as that TV season began, so I’m certain we spent a few Sunday nights watching TV with Grandma, most likely during the holidays, when Sunday wasn’t a school night for a 13-year-old. Here’s about 18 minutes that may give some idea of what that was like. His guests, ever so briefly, include the Smothers Brothers, John Hartford, Nancy Sinatra, Stevie Wonder, Tom Jones, and Sonny and Cher. However, television eventually gave way to the radio for me. Glen Campbell faded from my radio until the mid-’70s. His new songs? Too much corn. Along the way, Glen Campbell became a train wreck. He’s almost unwatchable in a “Tonight Show” clip with Don Rickles and Dom DeLuise from September 1973. He’s jacked up on something, and even Johnny Carson acknowledges it. Then along came Tanya Tucker, and more drugs and alcohol, and Glen Campbell became tabloid fodder. Didn’t really think much about him for a long time. Fast forward to the last decade. Fellow music bloggers have pointed the way to gems from Glen Campbell’s long career, helping me rediscover his greatness. Then, in June 2011, came his Alzheimer’s diagnosis. Our family knows all too well what that means. You lose a loved one long before they go. We bought tickets for “The Glen Campbell Goodbye Tour” stop in Wausau, Wisconsin, in December 2011, but the show we’d hoped to see was postponed. He had laryngitis, it was said. We couldn’t make the rescheduled date. Shortly thereafter, we had a second chance. The Goodbye Tour came back around, this time in Green Bay in June 2012. We passed. No regrets. We chose to remember a vibrant Glen Campbell instead of a 76-year-old man who was a year into an Alzheimer’s diagnosis. You’ve heard all the hits again this week. So please enjoy these tunes, proof again of Glen Campbell’s gift for interpreting other people’s songs. “Times Like These,” Glen Campbell, also from “Meet Glen Campbell,” 2008. The Foo Fighters never sounded so elegant. “Wichita Lineman/By The Time I Get To Phoenix” the Dells, from “Love Is Blue,” 1969. The great Chicago soul group acknowledges Glen Campbell’s greatness at his peak. Only Glen Campbell can make the Dells sound rough by comparison. Heard today that the Marshall Tucker Band will be playing our local vintage movie palace-turned-performance venue in a few weeks. That show, on April 2, will come almost 40 years to the day since I saw the Marshall Tucker Band. Well, sort of. The Marshall Tucker Band was on stage at the Quandt gym in Stevens Point, Wisconsin, on Friday, April 1, 1977. I was in the audience. I was 19. Many other details have been hazy ever since. The Marshall Tucker Band was one of the biggest names in country rock, which itself was big at the time. They were at their peak, touring behind the “Carolina Dreams” LP and having just released “Heard It in a Love Song” as a single. Both the album and the single turned out to be their biggest hits. It was a big deal that they’d play this small college town in central Wisconsin. Point was a half-hour’s drive south for us. When I say us, I can’t be more specific than that. Don’t remember who I went with. We went to a house party before the show. I want to say it was a little house on Division Street, the main north-south drag in Point and just off campus. Someone knew some guys that lived there. Older guys, maybe seniors, maybe 23, 24, 25. Turned out to be way too much party for that 19-year-old kid. Even so, I vividly recall sitting in the cluttered living room of that little house, really digging a Steely Dan record. It might have been “Countdown to Ecstasy.” That detail also has been lost to the haze of time. It’s proof, though, that I really must have been overserved. I never liked Steely Dan. At some point, I was sure we needed to get over to the gym. Whoever I went with said, nah, we have plenty of time. So of course we were late. This review of the show was from The Pointer, the student paper. It was written by a guy who became one of my college classmates later that year. Just about everything in his review is news to me, especially that it poured that night. Turns out there was a mad rush to the seats. No wonder I wound up a million miles from the stage. One side of the Quandt gym has two tiers of bleachers. I found a spot along the front railing of the top tier, near an aisle. I sat and kneeled there as best I could. There, my friends, is where the story fully fades into the haze of time. Save for one detail. I never liked the Marshall Tucker Band, either. Not when you could hear this fine piece of hippie country rock on the late-night free-form FM radio of the time. “Two Hangmen,” Mason Proffit, from “Wanted,” 1969. Earlier this year, we shared an appreciation of four music greats who are still with us: Chuck Berry, Little Richard, Jerry Lee Lewis and Tina Turner. They’re my four. Yours may be different. Yet that train keeps bearing down on us, taking Scotty Moore, Mack Rice, Bernie Worrell, Ralph Stanley, Wayne Jackson and Chips Moman this month alone. Since we last gathered here, Guy Clark, Candye Kane, Billy Paul, Lonnie Mack and Prince also have left the building. In a year in which we have lost so many music legends, it seems wise to not stop at four. It also seems wise to not wait too long. So here are four more music greats who are still with us, all of them still going strong. This is by no means the B team, or the second tier, or anything like that. Just four more worth appreciating here and now. Mavis Staples, 76. The beloved gospel/soul/R&B singer released a wonderful new record, “Livin’ On A High Note,” in February. That same month, “Mavis,” a documentary profile, premiered on HBO. She’s playing gigs across North America through November, then will receive Kennedy Center Honors in December. “Revolution,” Mavis Staples, from “Hot Wacks,” 2013, a compilation of artists on the Anti- label. A distinctive cover of the Beatles song from one who’s long sung about revolution. Tom Jones, 76. Sir Tom is performing gigs across Europe this summer in support of “Long Lost Suitcase,” a roots record released last October as the final part of a trilogy that also includes “Praise & Blame” and “Spirit In The Room,” which came out in 2010 and 2012, respectively. “Long Lost Suitcase” also is the companion piece to his memoirs, “Over The Top And Back.” It’s been a tough year, though. His wife of 59 years, Linda, died in April. “Dance of Love,” Tom Jones, from “This is Tom Jones,” 1969. It’s a tune written and done first by Charlie Rich in 1965 on the Smash label. Dennis Coffey, 75. This Funk Brother is still playing some mean rock and jazz guitar “in the D.” He tweets out his shows at @DennisCoffeyDET, announcing on relatively short notice that he’ll be at the Northern Lights Lounge — his most frequent Detroit gig — or at Motor City Wine, or at the Dirty Dog Jazz Cafe. His blog is recommended reading. Coffey shares lots of good stories there. Likewise his discography for record collectors. His last record, the solid, self-titled “Dennis Coffey,” came out on Strut Records in 2011. It’s worth checking out. “Never Can Say Goodbye,” Dennis Coffey, from “Goin’ For Myself,” 1972. A cover of the Jackson 5 tune on which Coffey demonstrates a little bit of soul, a little bit of funk and a bit more jazz. Gladys Knight, 72. Another of the great ladies of soul, she’s playing gigs in Europe and the United States through October. A solo act for almost 30 years now, she hasn’t had the late-career success of her peers. Widely known today for lush ballads and inspirational songs, Gladys Knight belongs here because of her energetic performances with the Pips in the late ’60s and earliest ’70s on Motown’s Soul label. She really did get down to the real nitty gritty, kids. We interrupt our appreciation of music legends still with us for an appreciation of something else still with us. AM, Then FM is quietly celebrating its ninth anniversary in the blogosphere. It arrived on the scene during the last week of February 2007. It gradually gained a modest group of regular visitors, thanks to gracious and kind support from fellow bloggers who remain friends to this day. Back then, there were many blogs, many readers. Times change. — Our son had just turned 12 and was in sixth grade. He’s now 21, a college junior, performing in still another play this week and heading to New York on a spring break theatre tour in a couple of weeks. — I’d just marked 29 years in the news business. I’m no longer in the news business. But I’ll continue to buy records and talk about them here as if we were in the same room, listening to them and sharing our takes on them. Your continued loitering is much appreciated. We’ll keep on keepin’ on. “Cloud Nine,” the Temptations, 1969, from “The Motown Story” box set, 1970. It’s out of print. This cut features a minute-long intro with Otis Edwards discussing how they came to record the song during the fall of 1968. He insists it’s about the state of black life at the time, and not about drugs, as widely believed at the time. Also featuring Dennis Coffey on lead guitar and Mongo Santamaria on conga drums. Santamaria covered it later that year on his “Stone Soul” LP. “Cloud Nine,” Gladys Knight and the Pips, from “Nitty Gritty,” 1969. A cool cover on which the Pips get gritty, too. It had been so long since someone asked, the question damn near startled me. Some of my records? These records? And then my head cleared. Yes, of course, you can borrow some of my records, Evan. Just as my friends and I shared records back in the ’70s, when none of us had all that many LPs or 45s. So off to college they went last week, two from Creedence Clearwater Revival, one of Evan’s faves of the moment. 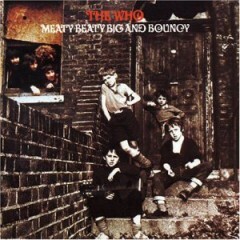 So off to college it went, “Meaty Beaty Big and Bouncy,” a compilation of early Who singles. When I told Evan that it came out in 1971, before the release of “Baba O’Riley,” his favorite Who song, he wondered when I’d gotten it. The record sleeve told all. “Meaty Beaty Big and Bouncy” came from Inner Sleeve Records in Wausau, Wisconsin, sometime in the mid-’70s. 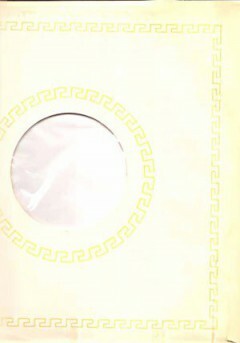 Back then, when you bought a record there, you got a nice sleeve to go with it. Those Creedence records were even older. Off to college went “Willy and the Poor Boys” and “Pendulum,” from 1969 and 1970, respectively. Evan grabbed the former because it has “Fortunate Son,” one of his favorite protest songs, on it. Hope he enjoys them as much as I did, even though he’s several years older now than I was when I spent a lot of time listening to Creedence. I was just a junior-high kid then. That said, I long ago grew tired of hearing the hit singles over and over. These days, I enjoy the Creedence tunes less often heard. 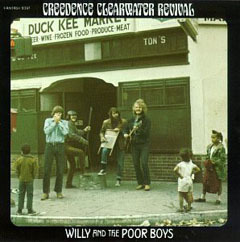 “It Came Out Of The Sky,” Creedence Clearwater Revival, from “Willy and the Poor Boys,” 1969. Also available digitally. In which a UFO lands in a farm field just south of Moline and the Establishment, circa 1969, freaks out. Enjoy the ride as John Fogerty gleefully sticks it to The Man.